Our high quality cotton sleeping bags, offered in several stylish designs, are double lined for your babies comfort and begin at under $15.00. To learn more about baby sleeping bags click on the image. Setting the new standard in sleeping bag luxury for the baby who has it all. 100% very soft Charmeuse silk shell and diamond-quilted silk inner lining. Only silk touches your baby's skin. Deluxe coordinated zippers and snaps. Our high quality cotton sleeping bags, offered in several stylish designs, are double lined for your babies comfort and begin at under $25.00. Our high quality baby sleeping bags, also called baby sleeping sacks are available in three different sizes from infants to the hard to find toddler size common to Europe. Whether you are looking for a practical baby blanket for yourself, a unique baby gift for a friend's baby shower, or are a proud grandparent looking out for safety, a BabyinaBag sleeping bag will meet your individual needs. Click here for more details. Used safely in Europe for over 25 years, baby sleeping bags ensure that your child is always covered and warm, regardless of how actively they may sleep. 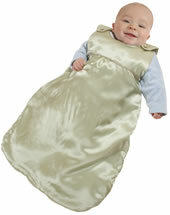 Baby sleeping bags are the safer, more comfortable alternative to traditional loose baby bedding. Designed as a wearable blanket, a baby sleeping bag keeps your baby comfortable and warm all night long, so you'll sleep better too! * Value: Prices are starting at only $21.95! Unbelievable quality for the value and a 6 month warranty on materials and workmanship. Your baby's comfort and safety are worth it! * Broad selection: We offer 100% cotton, organic cotton, 100% silk and the super stylish and ultra soft Minky fabric! * European sizing: We carry sacks in the very hard to find sizes for older babies and toddlers too. * Breathable summer and winter models: We offer both, lightweight summer models as well as cozy, quilted winter models to suit every climate and season. * Comfort: Only 100% soft jersey cotton touches your baby's skin - no synthetics! Cotton or Fleece, what is the better material for your baby sleeping bag? Is your baby sweaty in their sleeping bag? Synthetic fibers like fleece and polyester absorb moisture in very small amounts and hence are the least desirable fabrics touching your babies skin. With our bags, only soft jersey 100% cotton touches your baby's skin, allowing for as comfortable sleeping experience as possible. If babies are comfortable, they tend to sleep longer. So enjoy that extra rest! Why using baby sleeping bags instead of blankets? * Your baby is covered and warm all night. 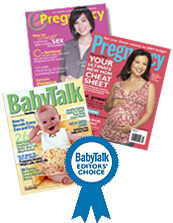 * No more kicked off covers means your baby sleeps more comfortably. * Eliminates loose bedding in the crib. * Helps your baby sleep through the night. * Baby sleeping bags are the perfect baby gift at every baby shower. I had searched everywhere to find European-style sleeping bags here in the US and was so excited when I come across Baby in a Bag.com. 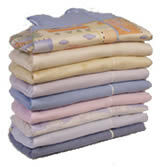 Your sacks are of very high quality, withstand numerous washings and come in cute patterns. They keep my toddlers warm at night and confined to their crib! I can highly recommend them. I received the package this morning. LOVE IT LOVE IT LOVE IT!!!!!!! I was introduced to the Baby in a Bag sleeping bag website through a friend. The bags are of the highest quality available. For discerning parents, these are the "must have" for your little precious one. I would definitely recommend everyone to give these sacks a try! Your bags are much nicer looking and warmer-feeling than those available in the UK. Thank you!